The teen I care for made this pencil topper for his little sister using a hot glue gun. I don’t recommend young children using hot glue guns. But, you can easily and safely use white glue instead if you are making simple pencil toppers. 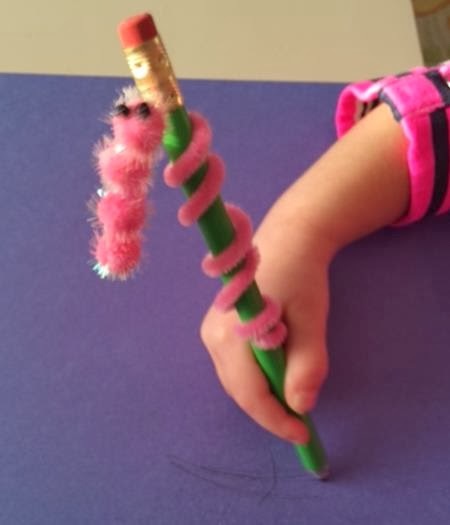 Hot glue works better than white glue when making the caterpillar pencil topper pictured above and below. 1. An adult or teen should use a hot glue gun to attach four pom poms to each other to make a caterpillar. Glue two beads to the head of the caterpillar to resemble eyes. 2. Have the kids wrap a pipe cleaner around the middle of the pencil and secure it tightly so that it doesn’t slip up and down the pencil easily. 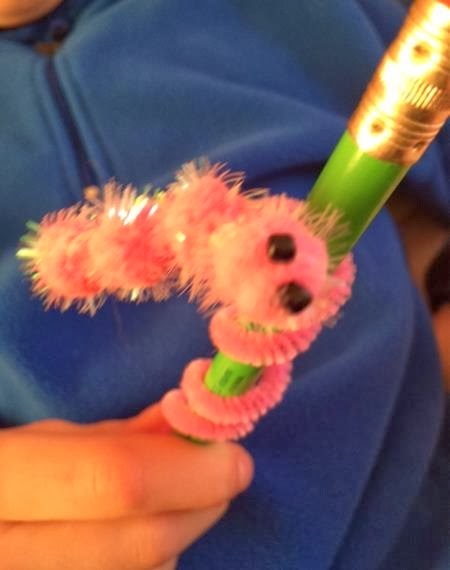 Move the pipe cleaner towards the top of the pencil. 3. An adult or teen then glues the pom poms to the top of the pipe cleaner.